Description of "One Cosmic Being"
Human life offers us a unique opportunity to consciously participate in our evolutionary process. The greatest freedom in the world is to free our mind from a narrow view of who we are and recognize our oneness so that we may enjoy life in its pristine glory. It is the highest gift we can give to ourselves. “One Cosmic Being” is my humble attempt to share a simple view of the philosophy and the art of living oneness envisaged by the Vedic Rishis, the great thinkers of ancient India. Their wisdom is secular in nature and forms the basis of India’s timeless spiritual culture. It transcends differences of time, culture, and spiritual views whether theistic, atheistic, or agnostic. It is invaluable to anyone looking for inspiration in trying to bring about a peaceful resolution to conflict, both internal and external. With a lifelong passion for philosophy, architecture, and good humor, Daksha Shukla is a dedicated sadhak (spiritual seeker). As a part of her spiritual journey, the author, a single mother of two young men, has spent much time studying Vedanta in the gurukula tradition. She has also relentlessly pursued the wisdom of other great spiritual traditions of the world. "One Cosmic Being" is the result of her intense study and reflection over the years. Written in simple terms, her book is meant especially to serve those who are seeking fulfillment, happiness and freedom from stress in our fast-paced complex every day worldly lives. The author sincerely hopes that her book will contribute in some way to promote happiness and unity among her fellow beings. 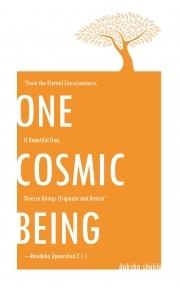 Reviews of "One Cosmic Being"
Its a very humble and unique approach to explain the Vedic Philosophy & it's scientific nature and try to bring an answer to the nuanswered question of formation of the universe and evolution of life! It also shows the world of the secular nature or "Dharma" of Hindu philosophy which lies in the treasures of Vedas. A turly commendable and stupendous effort by the writer with her unique, innovative & indigenous understanding of the great ancient philosophy, which enlightens our narrow and directionless minds with the drops of knowledge. GREAT EFFORT!!! !